Dan'l Boone Inn has been serving up family-style southern cooking for over 40 years. From fried chicken to country ham biscuits you're sure to fall in love with the food. But a delicious meal isn't the only thing you'll find in Boone North Carolina. You'll also find a wealth of Things to Do in Boone NC, Boone NC Attractions, and Places to Visit in Boone NC. There is a long list of exciting Attractions in Boone NC, so be sure to check out some of these! Tweetsie Railroad has been delivering "Wild West Family Fun" for years. Located between Boone North Carolina and Blowing Rock NC you can ride the historical locomotive, enjoy riding the Ferris wheel or merry-go-round and other exciting fair rides, or watch Diamond Lil' and her beautiful can-can girls in the Tweetsie Palace. This Boone NC Attraction will be fun for the entire family! Grandfather Mountain, near Linville North Carolina, is another Boone NC Attraction offering something for the whole family. Walk across the thrilling mile-high Grandfather Mountain Suspension Bridge for breathtaking views and you might even feel it move just a little! Visit one of the many animal habitats to see black bears, otters, and majestic bald eagles. You can even enjoy a stroll through the Nature Museum where you'll have the chance to see the largest amethyst ever discovered in North America! 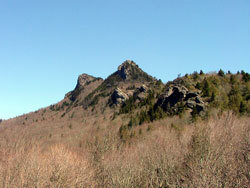 Grandfather Mountain North Carolina is a wonderful Place to Visit in Boone NC! Just a few minutes from Grandfather Mountain North Carolina is Linville Caverns! Linville Caverns will lead you deep into the depths of the North Carolina Mountains where you’ll find dark caves of stalactites and stalagmites and small streams that are home to blind fish! This is a great activity for your family and is also suitable for large groups! This is a wonderful adventure inside a mountain! Be sure to visit The Blowing Rock, just a few minutes down the road in Blowing Rock North Carolina. This stunning attraction set on the edge of the beautiful Blue Ridge Mountains offers breathtaking views year round and a little bit of Native American legend as well! This is a fun attraction for children and adults alike! 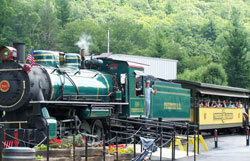 Any one of these Boone NC Attractions is sure to compliment your trip to the Dan'l Boone Inn. The excitement you'll encounter during your next trip to the High Country doesn't stop with these Attractions in Boone NC. There are lots of other Things to Do in Boone NC like Hiking North Carolina, Skiing in North Carolina, and lots of other Places to Visit in Boone NC.